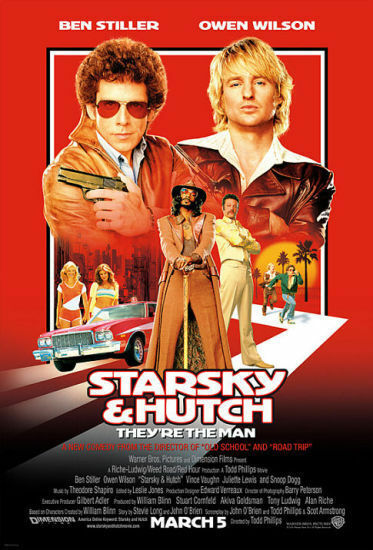 Starsky & Hutch is not a very good movie. In fact, the only reason it has more than 2 stars is that I gave it an extra star because it made me laugh a couple times. It’s really telling that I laughed harder watching the outakes than I did during the movie itself. There is hardly any plot at all, as if the writers thought they could skate by with a thin plot as long as the focus was on individual scenes. The problem is that the scenes didn’t end up being all that funny and so the whole thing felt like it was barely patched together. There were a bunch of things that just didn’t make any sense. For instance, Starsky is supposed to be some by-the-rules cop. They establish this in the first scene by having him chase down and shoot a guy who stole an old lady’s purse (containing only ). And yet within 15 minutes he’s in his cool car doing donuts and burning rubber and almost hitting other cars on the road. Is that sort of contradiction supposed to be funny, or is it a sign that the movie just isn’t trying at all? I’m voting for the latter. Do yourself a favor and skip this one. Go see Zoolander or There’s Something About Mary instead.